I thought I had left it too late in the season to share this recipe with you but with an Indian Summer here for at least the weekend I’m in the nick of time. We came up with this little wrap combo when the children wanted aubergine and avocado for lunch. There’s a little bit of stove time if you want to griddle the veg before roasting (worth it in my book) but otherwise it’s a pretty easy meal to prepare. Slice the aubergine on the diagonal. Sprinkle a plate with salt and lay the aubergine slices on it. Sprinkle salt on top of aubergine and layer if necessary. Set aside for 20 – 30 minutes. Rinse to remove salt. 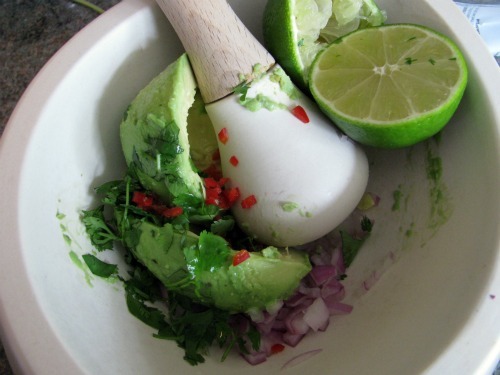 Put the onion, chili and coriander in a mortar and bash with a pestle. In each wrap: spread 1 spoon of yoghurt and 1 spoon of guacamole. Pile on some veggies, roll and wrap ensuring the bottom is tucked over or it will drip! it is 9am, I am just back from the school run, had breakfast and now I am hungry already!!! Yay! Think we have had out last serving of this for the year, can’t wait to bring it out again next summer. 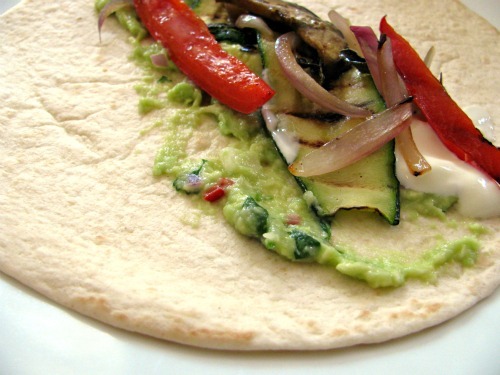 @thatkat: Latest at Housewife: Roasted Vegetable Wraps with Guacamole a recipe for the Indian Summer – http://ow.ly/6JAQS <<<yumm! 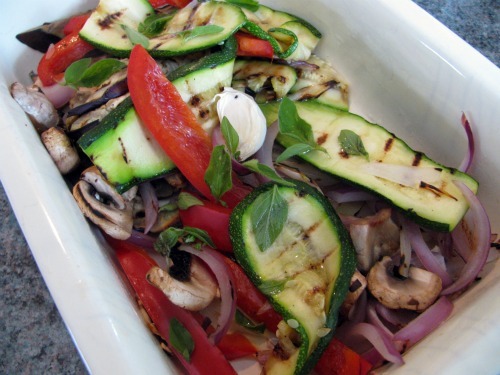 I really don’t think there is anything tastier than griddled courgette… mmmm.